Fresh Strawberry Muffins are really sweet muffins with a nice, moist texture and delicious taste. 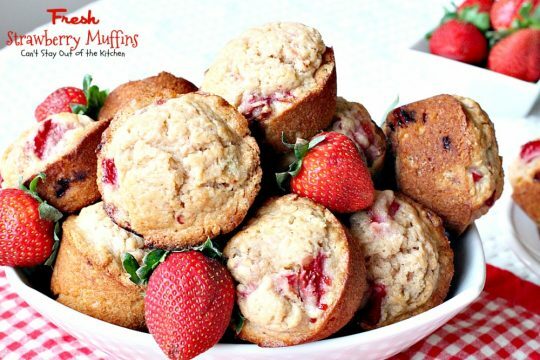 There’s nothing unusual about these muffins – they have lots of fresh strawberries and cinnamon – and they’re incredibly easy to make. They have only 8 ingredients without lots of difficult steps, so they’ve always been a very popular muffin to make around our house. The first time I sank my teeth into one of these tasty treats was a few years ago when one of the gals in our Sunday school class brought them to breakfast that morning. After the first bite I knew I had to have the recipe for these quick and easy muffins. This recipe is pretty simple and straightforward. You can have these ready for the oven in about 5-10 minutes and they take about 25-30 minutes to bake. They are great fresh out of the oven while they’re still hot. My friend, Michelle, found this delightful recipe in her Gooseberry Patch Country Baking cookbook. 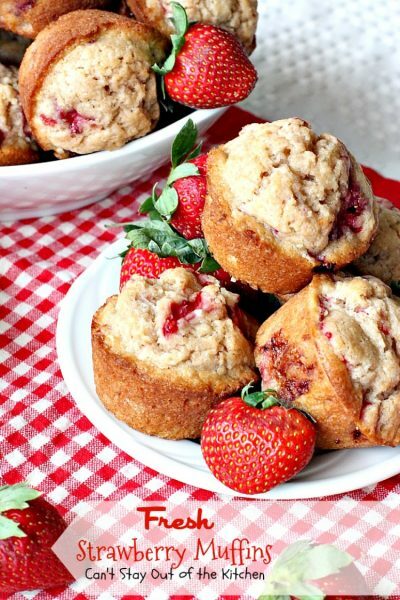 Gooseberry Patch has become synonymous with offering really great recipes, and this Fresh Strawberry Muffins recipe is no exception. Lots of juicy strawberries fill every bite! I have made several things out the of Country Baking cookbook. I highly recommend it if you are looking for some great recipe ideas. 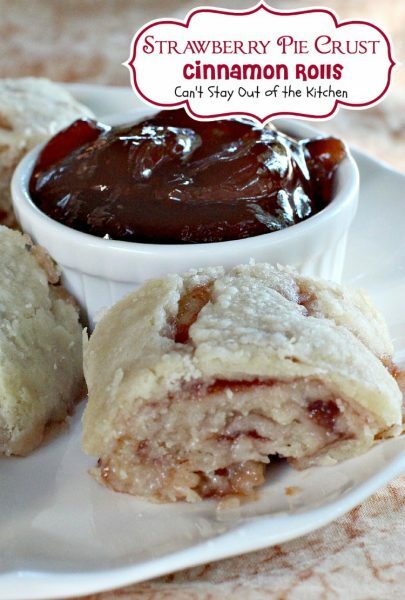 This is a great breakfast treat for your family. Strawberries are available year-round these days so you can make these up anytime. They’re a great treat to bring for holidays, office parties, or even to a sick neighbor. This batch makes 18 which is a nice amount to have for your family and to share a few, too. 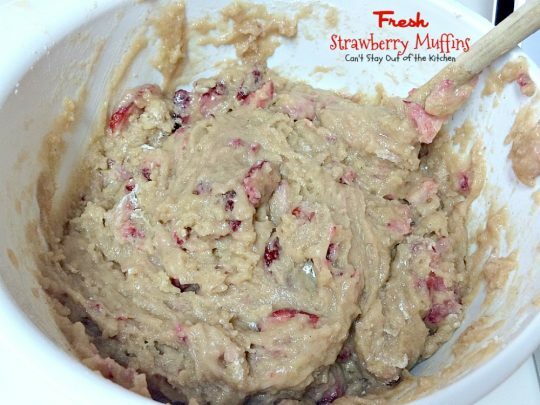 🙂 If you’re looking for a way to use up fresh strawberries this recipe is excellent. 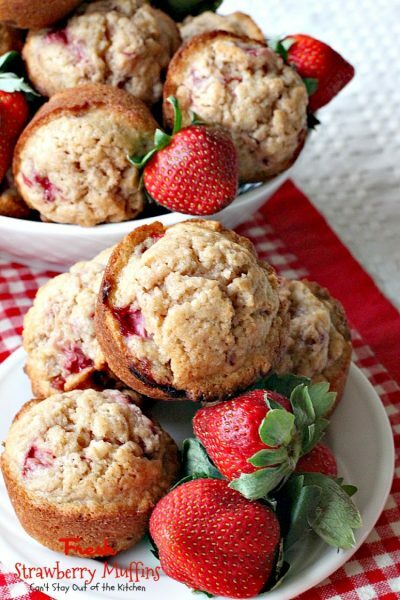 Our family has always enjoyed these sweet, fruity, juicy muffins and we believe you will as well. Why not give them a try the next time you make breakfast for your family. They’re so easy and very economical. I initially posted this recipe in April 2013. I had recently purchased my Canon camera but wasn’t proficient at using it, so these pictures were shot with an iPhone instead. There’s just no comparison. I’ve been systematically going back through all my old first year blog recipes and remaking them so I can shoot new pictures that are more presentable. While I was making this recipe again (December 2015), I decided to make a few tweaks as well. The recipe called for two cups of sugar and three cups of flour. I knew that was why the muffins flattened out and dropped rather than holding a beautiful muffin topper shape. I adjusted the recipe by decreasing the sugar by 1/2 cup and increasing the flour by 1/2 cup. Then I started the recipe at 425 and baked the muffins for 5 minutes at this higher temperature. Then I decreased the temperature to 350 for the remainder of the baking time. This allowed the muffins to puff up nicely the first five minutes of baking, and the steady lower temperature for the last 15 minutes kept the muffins from falling. These muffins were picture perfect and a lovely gift for friends. Give Fresh Strawberry Muffins a try and you will see just how enjoyable these lovely muffins turn out. 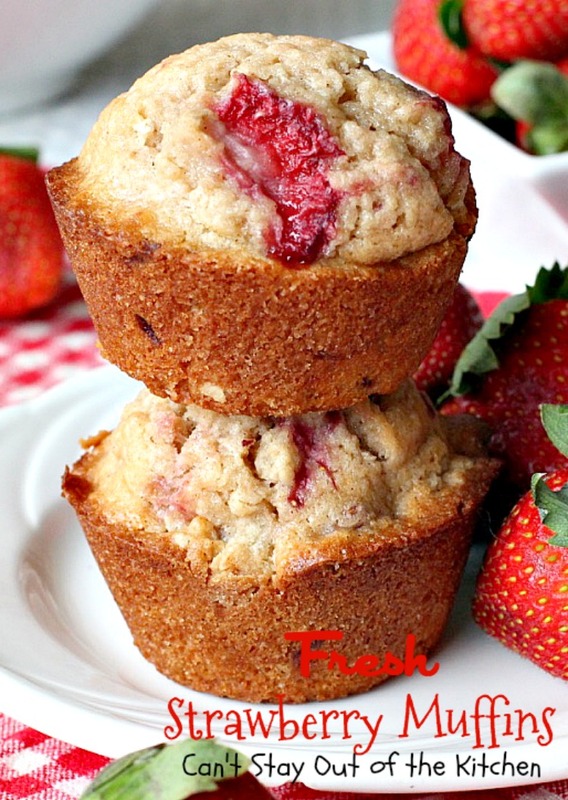 Fresh Strawberry Muffins are featured on Shari’s Berries blog here. 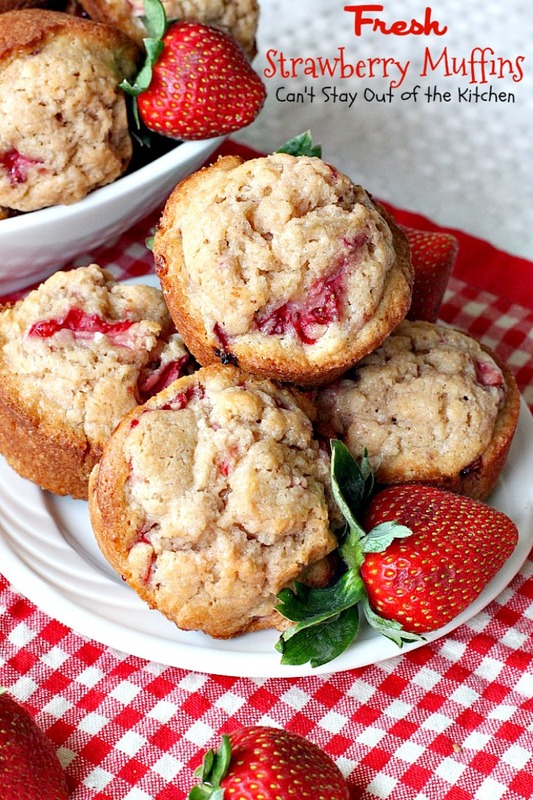 Fresh Strawberry Muffins are festive, beautiful and incredibly delicious. 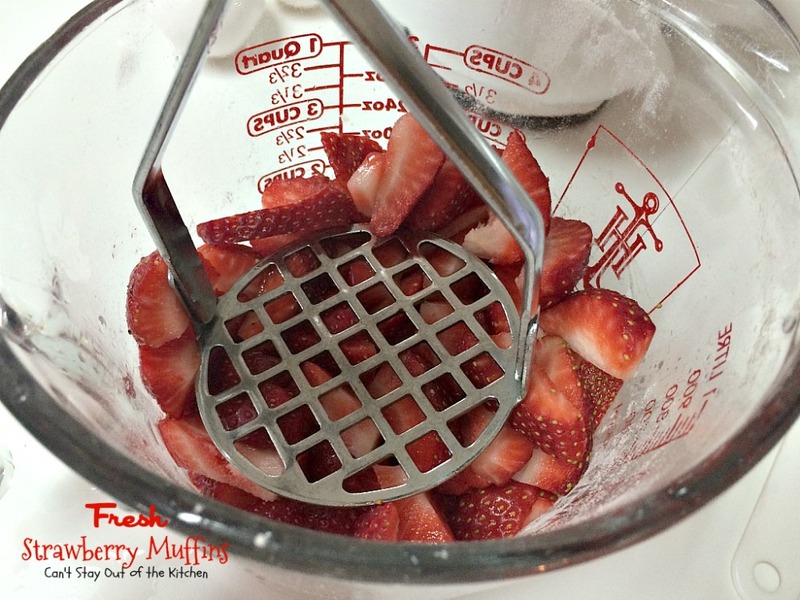 These muffins are tasty as well as being quick, easy, and economical. 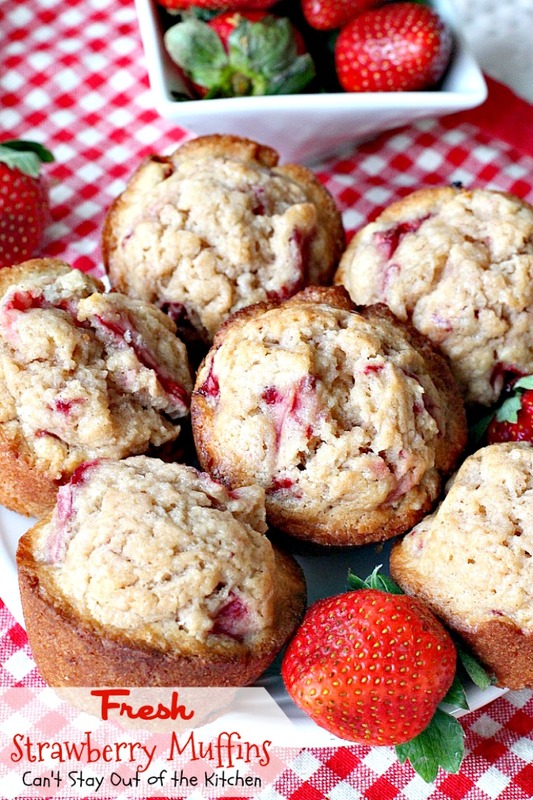 Fresh Strawberry Muffins are great for holiday breakfasts. I’m ready to sink my teeth into one of these right now! Place UNBLEACHED all-purpose flour in a mixing bowl. (Bleached flour toughens baked goods). Add sugar, cinnamon, baking powder and salt. Stir ingredients until combined. Place sliced strawberries in a bowl. Mash down slightly with a potato masher. 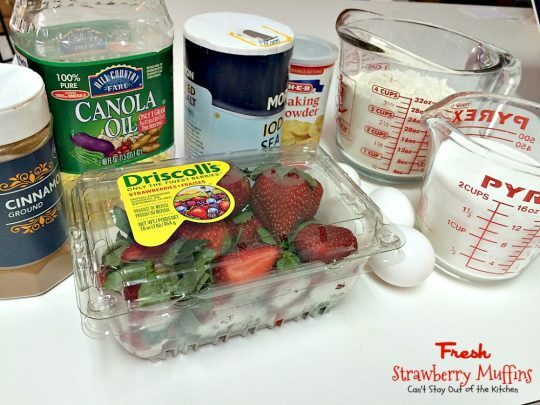 Add strawberries to egg mixture and stir again to combine. Add strawberry/egg mixture to flour mixture in bowl. Stir ingredients with a wooden spoon to combine–just until moistened. Spoon muffin batter into greased muffin tins until almost full. Bake at 425 for 5 minutes. Reduce heat to 350 and continue baking an additional 15-19 minutes or until a toothpick inserted in center comes out clean. Allow muffins to cool slightly before removing from tins and serving. Makes 18-19 muffins. This recipe is quick and easy to make. A batch of muffins can easily be ready in 45 minutes. Serve with fresh fruit. Fresh Strawberry Muffins are great for country breakfasts, or surprise your family and serve them for snacks or to eat along with a hot bowl of chowder! 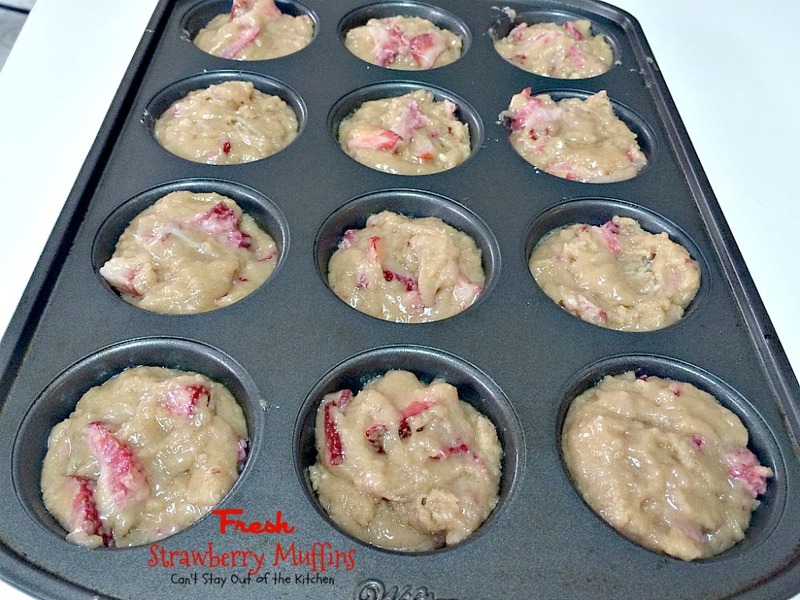 Quick and easy breakfast or brunch muffins using fresh strawberries and flavored with cinnamon. Tasty and delicious. In small bowl, combine eggs and oil. 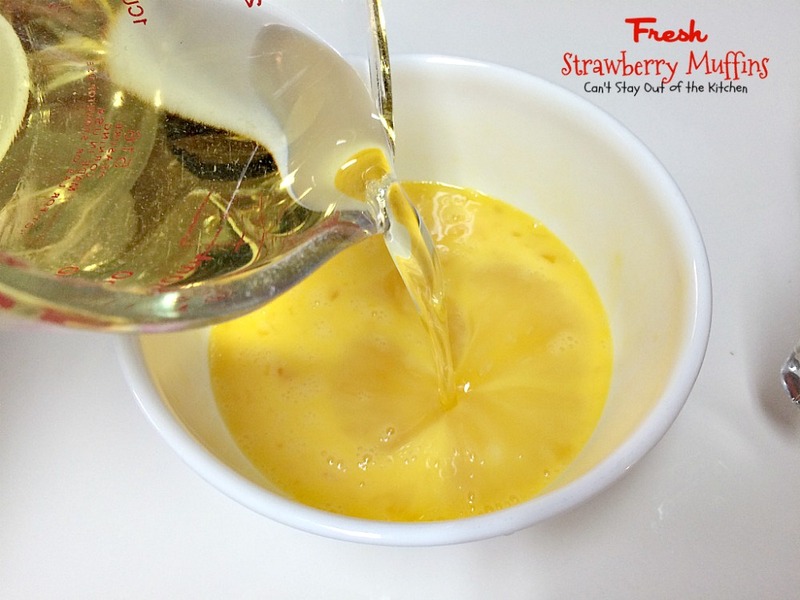 Stir strawberries into egg mixture. Blend in flour mixture until thoroughly combined; but do not over beat. Bake at 425◦ for 5 minutes. Reduce heat to 350◦ and bake an additional 15-19 minutes or until a toothpick inserted in center comes out clean. NOTE: The original recipe calls for 3 cups flour. I've used up to 3 1/2 cups flour before with good results. But because some folks who tried this muffin thought it came out too stiff, like cookies, I've reflected the change in the flour again for future makers of this recipe. Recipe source: adapted from Gooseberry Patch, Country Baking Cookbook. The original recipe calls for 3 cups flour. I’ve used up to 3 1/2 cups flour before with good results. But because some folks who tried this muffin thought it came out too stiff, like cookies, I’ve reflected the change in the flour again for future makers of this recipe. 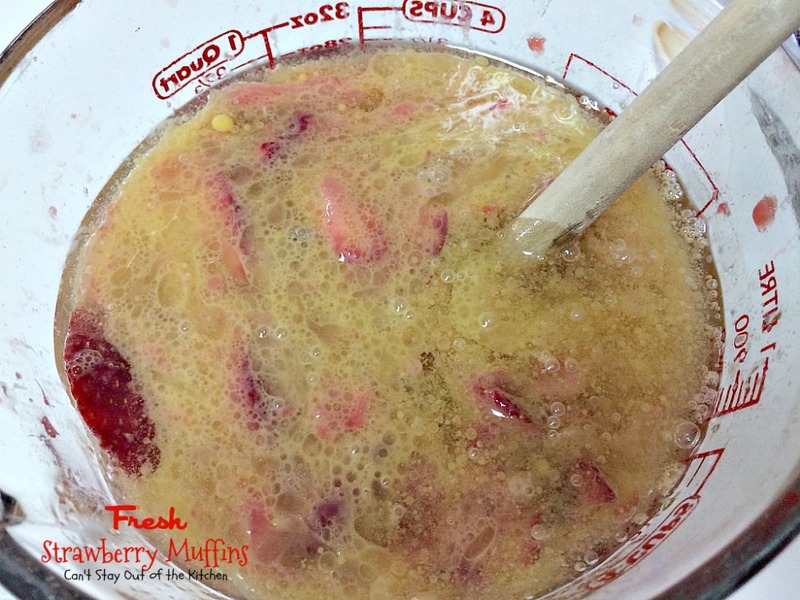 Fresh Strawberry Muffins are nice and moist because they are made with oil. Don’t these look great? Are you ready to sample one? Why don’t you whip up a batch of these for a nice Saturday breakfast sometime? 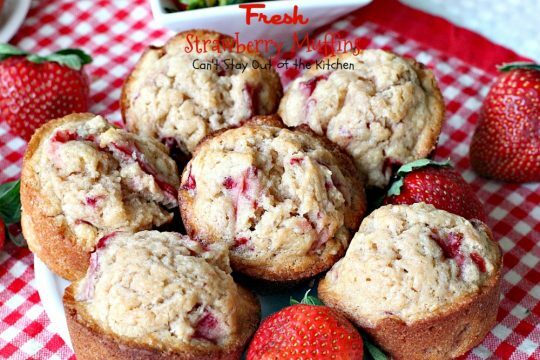 Fresh Strawberry Muffins are delicious. Why don’t you join me for a couple? These turned out wonderful. 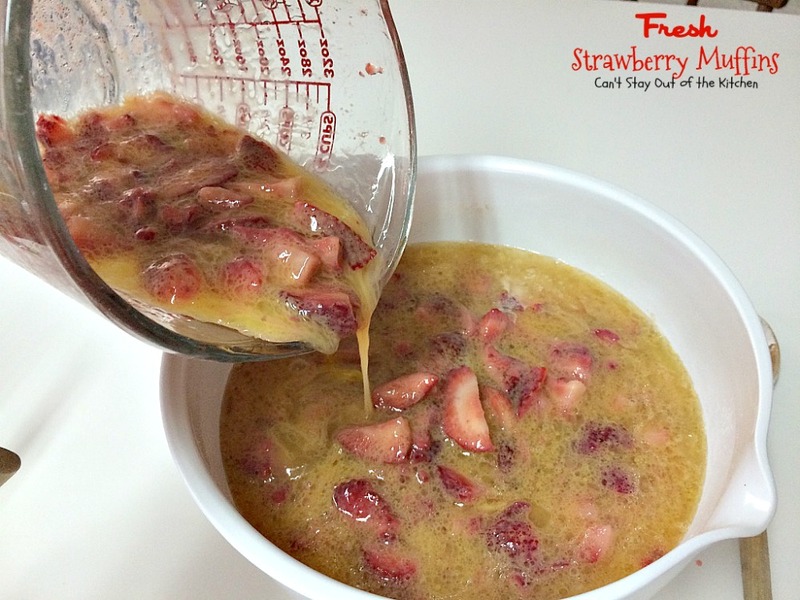 I added a few drops of almond extract and used strawberries I had picked fresh a few weeks ago and froze . Thanks for the recipe! Hi, Meg. I love the idea of adding almond extract. I bet they were wonderful! Thanks for stopping by. Have a great week. Just made these and love them so much! So fresh and delicious! My batter, too, was extremely thick, but so glad that they worked out! Thanks for the recipe! So glad you enjoyed them, Jessica. I made these today and they were delicious! This is a keeper, thanks for sharing the recipe! So glad you enjoyed them, Karen. It’s one of our favorite recipes! Hi. I’m new to baking. Can I use vegetable oil instead of the canola oil? Hi, Kathryn, yes you can use vegetable oil. Enjoy. I’m curious if anyone used coconut oil in the recipe and how it turned out. That is my preferred oil to use. Hi, Ellen. I haven’t tried coconut oil in the recipe but I’m sure it would turn out fine. Fingers crossed that these turn out. My batter was so dry I had to add 1/2 cup water just to be able to mix it. Hi, Brianne. Someone else said the same thing. I’ve never had a problem with the batter being too thick. Hope you enjoy them. Have you made and frozen the muffins? Hi, Cindy. I think I’ve done that with these muffins before. I know I’ve done it with almost every other muffin recipe I’ve ever made. Muffins usually freeze very well if you freeze them in a plastic container with a tight lid. Enjoy. Made these tonight they tasted great! but for some reason they came out almost brown like a banana nut bread color. I might have mashed the strawberries to much. Also not sure if my flour was bleached or non. I’ll try again another time and not mash as much and check the flour. Hi, Kellie, yes, if you mash the strawberries too much, the juice will cause the discoloration. We love these muffins and hope you and your family enjoy them too. Hi, Amanda. Hope you enjoy them. They’re certainly some of our favorites. Do you think these could be frozen after baking and cooling? Absolutely, Laura. I have done that many times. I do recommend, however, that you try to use them up within a month. After that, muffins tend to dry out. Just made these with gluten free flour and turned out delicious. But… What is the reason for 1 1/4 cup of oil? That seems excessive as a baker myself. How does this affect the recipe in your opinion an why you put it? Hi Julia. I believe the oil in the recipe makes the recipe moister instead of dry. Thanks for stopping by. Have a great weekend. yep – incredible. 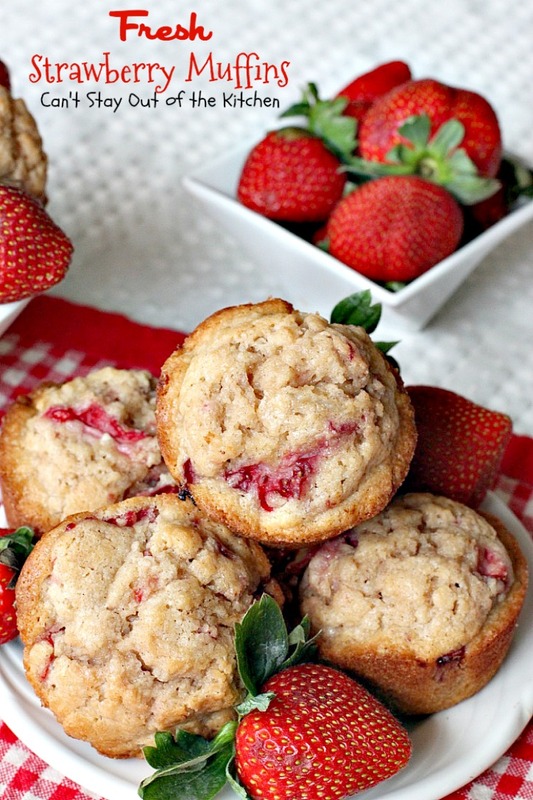 Kinda like strawberry shortcake in muffin-form. Yes, Stacie, I agree. These are incredible. Glad you liked them. Thank you for sharing this recipe. My 10 yr old daughter made these for our family without any assistance and she said they were easy and fun to make. She’s making them again today intact for our 4th of July party. sounds wonderful, Shelly. So glad your daughter had fun making them. They are pretty quick and easy. Planning to make these today but had one question. Can you use bleached flour with this recipe? Hi, Mavis. I don’t use bleached flour anymore because of what is done to the flour during processing, but yes, you can use bleached flour. Hope you enjoy them. Turned out great! Thanks so much! Glad you found them delicious, Jessica. Thanks for letting me know. Hi, Kathy, I would consider using coconut oil rather than applesauce and coconut milk for the milk or cream. I have heard about flax being reconstituted and used for eggs. It sure doesn’t hurt to try. 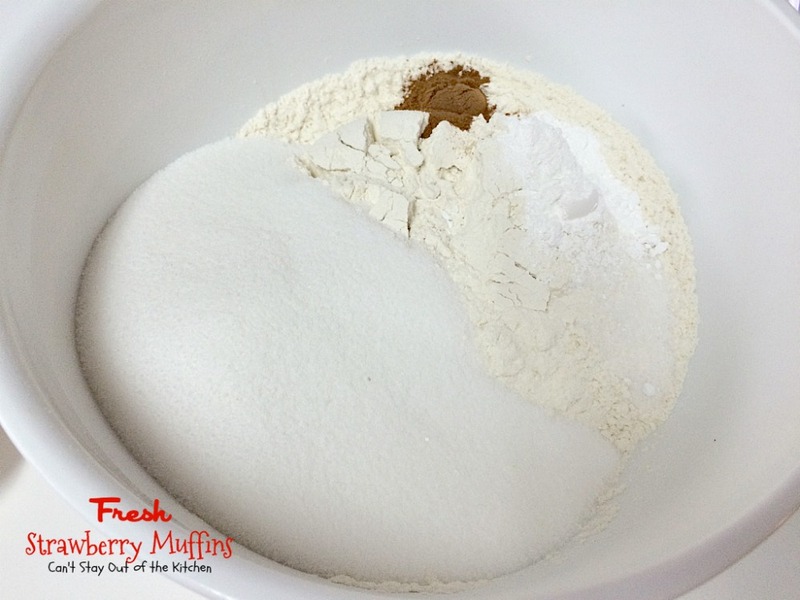 If the mixture seems too runny, you may have to add additional flour so the muffins don’t cave in in the middle after baking. I just made these since I got some fresh strawberries at the orchard. They came out fantastic! Thank you for sharing this recipe! I’m so glad you liked them, Amy. We’ve always enjoyed these scrumptious muffins. Do you think this recipe would work for a sweet bread? Just bake a little longer than the muffins? I think it would Sarah. You may have to bake as long as 45 minutes to an hour. Insert a knife all the way to the bottom of the pan. When it comes out clean & without goo, the bread is done. I made these with my 4 yr old and 18 mo old this afternoon. I reduced the sugar to only 1/2 a cup and they were still DELICIOUS. Thank you for sharing! Will definitely be saving this recipe, as it is so difficult to find good muffin recipes. So glad you enjoyed the muffins, Erin. These were delicious! 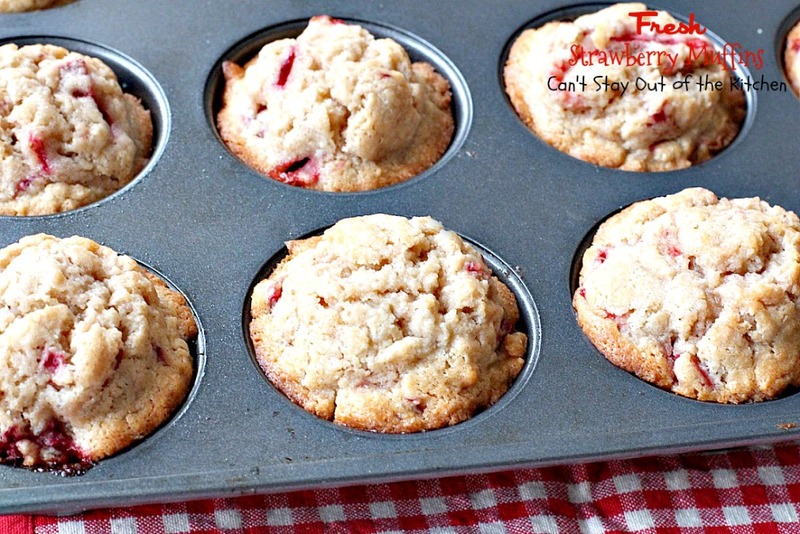 I made them in a jumbo muffin pan, so I had to bake them a little longer. Next time I will cut out the inner white part of the strawberries though. In some of the muffins it kind of looked like raw egg. My kids and I loved them! I wonder if this recipe would work with fresh blueberries. Hi, Jessie. Glad you and your family loved the muffins. I’m sure this recipe would work well with blueberries or almost any fruit you wanted to substitute. I was thinking the same thing- with blueberries And strawberries they’d be fun for July 4th- or any time. I’m trying it today. Oh I bet that will be an unbeatable combination, Polly! Hope you enjoy them. Hi Teresa, what is UNBLEACH all.purpose.flour? Hi, Nancy. Bleached flour uses chemical agents in the process. It is finer than unbleached flour. We read an article back in the 1980s that said the chemicals used cause the flour to actually cause toughening instead of the natural process of unbleached flour. As a result, we’ve used only unbleached flour for over 30 years. Is there supposed to be milk in these?? The initial ingredient pic shows milk in a measuring cup but it’s not in the list or instructions. I tried making them without and the batter was super stiff like cookie dough. Hi, Bonnie. Sorry you had problems with the recipe. The ingredient list picture shows unbleached flour and sugar; no milk. Did you use four large eggs and 1 1/4 cups oil? The batter shouldn’t be that stiff. If you try it again, start with 3 cups flour. Add the final half cup of flour slowly, but not if the batter looks different than what the pictures above look like, or starts getting too stiff. I’m with Bonnie. This was not like normal batter, more like cookie dough. Super bummed I just wasted ingredients… Wish i read the reviews first. I’m so sorry you had trouble with the recipe, Audrey. My recipe turned out perfectly, but I went back to my original recipe and reduced the flour to reflect the initial amount so others will not have further trouble. Thanks for letting me know. Mmm these look yummy and very moist. I absolutely love strawberries what a better way to put in a muffin. Definitely going to try making these for my family. Thanks, Lucy, they are really scrumptious. Hope you and your family like them. Would it work to use thawed frozen strawberries? Or would it change it too much? Hi, Andie. You could probably use them but you may have to pat them dry a little bit so they don’t add too much water to the recipe. If possible, I would try to get the frozen strawberries that are not packed in sugar as they will add too much juice and sweetener to the recipe. Yes, I’ll try to get over and pin a few more this week.